Everyone loves green bean casserole, and this classic holiday side just got even better. We ditched the cream of mushroom soup and french fried onions and added in fresh veggies and herbs. We love our healthy twist on this classic recipe because it makes for the perfect side dish all year long. In fact, it will definitely be on our 4th of July menu! Cook the green beans in salted, boiling water for 2 minutes. Drain and rinse with cold water and set aside to dry. Place walnuts in skillet; toast over medium heat or until lightly browned. Set aside and allow to cool. Heat about 1 tbsp. of olive oil over medium heat. Add onion and season with salt and pepper; sweat for 20 minutes until onion is very tender and golden brown, remember to stir occasionally. Stir in thyme and turn heat to medium-high heat, adding additional 2 tsp. of olive oil to pan. 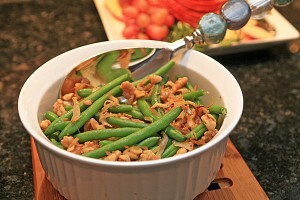 Add the green beans; cook 2 minutes or until thoroughly heated, stirring frequently. Remove from heat. Sprinkle with nuts, and taste for additional seasoning. I’ll have to try this one. Ditching the cream of mushroom soup and french fried onions greatly reduces the sodium content.